Do your tenants change their home’s air filter? Do they know when or how often they need to change it? Do they just forget about it, or are they just lazy? Do they know what size filter they need? Thanks to FilterEasy, there’s no excuse to not change it. Today, I am talking with Mark Brandt from FilterEasy, which was created to meet a simple need – help homeowners remember to change their home’s air filter and what size of filter to use. [04:10] Property management side of FilterEasy is based on a simple concept in service: Starts with a need. [04:50] Tenants are even more less likely to change the air filters because they do not have a vested interest in the property; FilterEasy makes it easier for them. [05:33] This service helps property managers and their team during inspections and walkthroughs to hold the tenant accountable and provides a burden of proof. [06:28] FilterEasy listens to property managers about the need and awareness to motivate tenants. [07:55] Many companies do not understand the industry and create a product before conducting research. [09:30] After implementing FilterEasy, the property managers, owners, and tenants appreciate the convenience, saving money, and other benefits. [11:45] Not changing the air filter can cause serious and costly damage to repair. [13:30] Can you guarantee that 100% of tenants will change the air filter? No, but FilterEasy sets you up for success by increasing the number of tenants who will. [18:00] Such programs and companies are becoming necessary to provide more operating capital to grow and competitive advantages. [18:35] When owners compare companies, what is the differentiator? What sets you apart from others? Why should they choose your company? [19:15] Property managers can use reminders to let tenants know they are giving them a gift and taking care of them; generates a positive perception and produces results. [25:00] Grow with the times and culture to provide awesome service to people; compete on value. Grow with the times and culture to provide awesome service to people. These programs provide operating capital and competitive advantages. What is the differentiator? Why should they choose your company? Jason: Welcome DoorGrowHackers to the DoorGrow show. If you are a property management entrepreneur that wants to add doors, make a difference, increase revenue, help others, impact lives, and you are interested in growing your business and life, and you are open to doing things a bit differently, then you are a DoorGrowHacker. DoorGrowHackers love the opportunities, daily variety, unique challenges, and freedom that property management brings. Many in real estate think you’re crazy for doing it. You realize that property management is the ultimate high trust gateway to real estate deals, relationships, and residual income. I’m your host, property management growth hacker, Jason Hull, the founder of OpenPotion, GatherKudos, ThunderLocal, and of course, DoorGrow. Now, let’s get into the show. Today, I have hanging out here with me Mark Brandt from FilterEasy. Mark, welcome to the show. Mark: Good to be here, thanks for having us. Jason: Mark, where are you at right now? Mark: I’m in Raleigh, North Carolina, our headquarters over here. We’re stationed out of Carolinas, but I’m in Texas a lot of the time. A lot of property managers see me a lot. Currently, I’m stationed at the headquarters in Raleigh. Jason: Great. How’s the weather over there right now? Mark: It’s beautiful, between 70 and 75 degrees today. It’s nice to have a walk or a run. All is good. Jason: Spring is here. Mark, tell me about how FilterEasy came about. I want to hear about the background of it and then what it is. Mark: It goes back a little bit before FilterEasy. I’ve been in business development mind, sales mind, and I was involved with another organization right out of college. Cutco the knife business and it has a big realtor business, too, a closing gift business. I started that and grew that and actually recruited a rep who ended up being one of the by top managers and guys. Upon our disposal from the company, he, Thad Tarkington went and actually started FilterEasy in 2012 with a buddy of his who was in college in NC State. It just started with a simple need, they got a filter and his buddy complained on not remembering to change it, it was hard to find the right size, and that initial conversation, just a casual conversation led to one idea which led to another idea which grew. Over the years, it started as a home subscription service–ecommerce to where we ship filters just to homeowners because homeowners is tough to find the right size, is tough to remember to change their home air filter. That’s been the service we’ve offered from the start and we have grown that to cover all 50 states and then at Canada. In 2015, I was doing some other businesses and then came back to Thad who I had to produce relationship and helped another gentleman, Tyler Whims, which a lot of property managers know, initiate and grow the property management side of the business. It’s a similar concept as a home business, shipping filters to people on the day they’re supposed to be changed. We actually had one of our clients who was a NARPM member for those of you who are not a NARPM–National Association of Residential Property Managers a wonderful organization, and actually invited us to become a vendor with them. We jumped head first with them and have grown the property management side over the last three and a half to four years from 2015 and have done well in that. That’s basically how we’ve gotten here, it’s a long story short. Just two guys with an idea and have gotten a lot of financing from outside investors. I know they travel the country recruiting angel investors and got a lot of good minds in it and we’ve grown that pretty significantly. Jason: Great, explain then this PM side of FilterEasy, how does this work? Mark: The property management side is a special program. We’re pioneered it. First to do it, and it’s a really simple concept. It begins with a need and we all know that tenants just don’t change air filters for several reasons. Laziness, which we all can be. People don’t remember, it’s just not something you think about every day. There are a lot of things to think about, changing air filters is not one of the top things. Homeowners do this, tenants are much more likely to do it because they don’t have vested interest in the property, they’re going to be in and out. Very low rate of actually getting this done. We have addressed this by just simply placing the filter in their hand, we ship the filter with the exact size on the exact date it was supposed to be changed. They get an in-hand reminder, shows up at their door, it comes with the property manager logo on the box. It’s from the property manager to the tenants, it’s not from us with a message directed to tenants, “Change the filter and save some money on the utility bill.” Expiration dates, we also stamp on the filters. This puts the property manager in a whole lot better position and inspection team when they’re doing the walkthroughs of holding the tenant accountable, they can see when they got the right filter in at the right time because now you can go into a home, the filter’s caked up with dust, and mold, and everything, and get on to them they can say, “The system’s broken down, I know it looks bad, but I changed it 3.5 weeks ago.” There’s no way really to prove what they did or didn’t. It helps take care of that burden of proof. It’s a simple concept, they’re just getting the filter in their hand that they have changed, your logo is on the box, branding, expiration dates. It just takes the laziness out and takes the reminder, you can’t forget it now, and of course not finding the right size at the store, they don’t have to search or ship them. That’s how our service works. That’s how it’s basically done. Mark: We’ve worked extensively with property managers. I especially get to go and actually tour the country, literally I have been over to 30 NARPM chapter meetings. I’ve been to all the way from Philly down the eastern seaboard, to Texas, to Boise, Idaho, to all the Seattle area property managers, to California, to Arizona and we’ve really listened to the need. Mano-y-mano versus just market research, we went out to listened to the need from property managers. We got intimate awareness and each part of the country, we have different climates. Not everybody is running ACs the exact same—or furnaces as the exact same as others. We’ve got a really intimate knowledge and awareness of what’s going on because we went out there and checked it out, we listened to property managers, and we’ve actually scaled our business based upon that. We’ve grown it pretty well. We’ve got a pretty good handle and we’ll continue to grow and scale, it’s exciting. Jason: I like what you’re saying about how you did your market research and doing a one-on-one. Me coming into the property management industry, I sort of fell into that accidentally. I was really trying to figure out how to help these property managers win, and figure out how to help them do a website, so I would ask a lot of questions. It was the same thing as one-on-one and what’s funny is since then, since we’ve established ourselves fairly solidly in the market, we’ve gotten a lot of people that reach out to me, different potential vendors in the property management space that have no clue about the industry. I had a company come to me and they’re like, “We have figured out how to generate leads for property managers and we should work together with you.” It was, “Great, that sounds awesome, tell me about it.”They’re like, “We figured out how to help them all get tenants.” I was like, “You don’t know my target audience. You don’t seem to have problems getting tenants.” They want more clients and they’re like, “Well, aren’t tenants their clients?” I was like, “Yeah.” That probably could have been solved by talking to one property manager, one person in their target audience. It’s funny that companies will develop a whole product before even doing any sort of research. This was really born out of a direct to consumer need and then you shifted into actually doing boots on the ground direct interviews and talking with property managers which is the smartest way to do product research. If anybody is listening, that’s an entrepreneur. If you want to know what the tenants or owners in your market are looking for, you just need to talk to them. This happens naturally in business, but usually when we become corporations, we get larger, we lose sight of that and we do crazy stuff like focus groups and things where everybody’s giving us bad feedback. We just need to talk to people. I like that. You mentioned that the direct to consumers is all through off—PM side currently what’s your reach? Mark: We service the same area. We actually have partners all the way from Florida to Alaska currently. We can reach even into Canada there as well. We have a pretty big reach. We can cover a wide range, everybody really in the country. Jason: Now, when you say partners, are you talking about your client base or do you have partners that are helping to deliver this service? Mark: Client base property managers in all those areas. 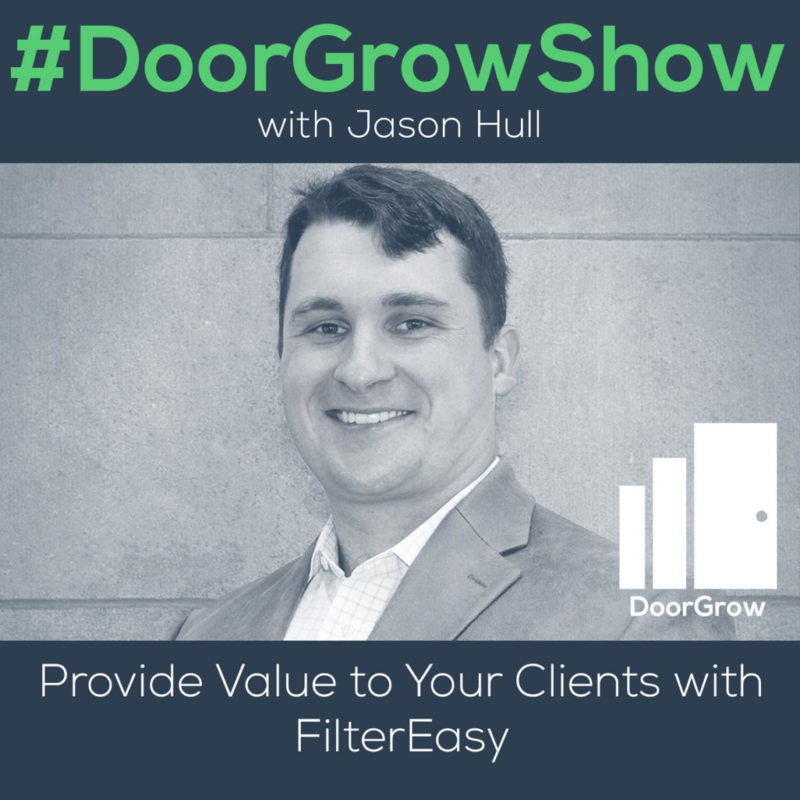 Jason: What are what are some of the things that your clients have noticed after implementing FilterEasy in their business versus before? What are some of the feedback that you generally are getting? millennial culture which is going towards the online grocery shopping thing. We wanted to fit what was going on the marketplace, but we wanted to make a value to everybody—the property manager, the tenant, and the owner. For the tenant, we provided them with the convenience, with the understanding that we can help eliminate the barriers to change, they’ll actually do it. You give them a product you’re supposed to get in a store, the right quality of filter versus any other quality they could go get which could be harmful for the system. Saving money on the utility bill, because changing that filter can save you a decent amount of money, $20 or more in a lot of markets a month, and a healthier home. For the owner, saving utility could save in the breakdown cost. As far as results, we’ve actually noticed very significant results. We’ve ran this program for a few years with property managers and they’ve actually had some data that they’ve actually reported to us. Based off using our program and implementing our program, we’ve gotten reports from 25% to 30% up to 60% reduction on the previous year’s HVAC problems or furnace problems, which is pretty big. Mark: Based off the feedback we’ve gotten from property managers who report to us via document actually, we’ve noticed 25% to 30%, we did have one establish a 60% reduction on the previous year’s HVAC breakdowns, furnace breakdowns because of the simple service of changing your filter. If you don’t change your filter, then there’s decreased airflow, compressors can burst, the system breaks down, it’s the number one way to service your home unit which a lot of people forget that’s why they get frozen coils, breakdowns, repair costs of $300 to $400, replacement cost of $5000 to $6000. These aren’t cheap, this is one of the owner’s most expensive investments in their home. If we can help extend the life of a unit, $5000 or $6000 unit from 10 or 11 years to 18-19 years or more, it’s a big win for the owner. Of course for the tenant, we’re providing those four values of convenience, we’re saving them money in utility bill. We’re also giving them a clean healthy home, healthy air for their family and products. Then we make it a win for them and then there’s less problems the property manager has to deal with. We feel like we have all three and of course continuing to get better and stronger. Jason: Let’s say you’ve got really lazy tenants because some people are thinking, “Man, my tenants, you ship something to their doorstep, they’re going to open it up, they’re going to throw it in the garage and they’re not going to pay attention.” You’ve mentioned that you have a note usually that mentions they’ll save money on their utility bill. That’s one way to drive them if they’re economically motivated. Is there any other things that can be done or to motivate these tenants to get these filters in place as quick as possible? some more stricter accountability programs. The fact they’re going out and getting their filter for the tenant, there’s really no excuse. That’s one of the cool things, “Can you guarantee 100% of tenants will actually change the filter?” No, you can’t. The only way you can do this is by doing it yourself and we all know that that’s unfeasible for a lot of people as far as cost. Managing people to do that which is another element and then time and all that. The only other way that you can really guarantee, the best way, what we tell people is, probably right now you have 10% or 15% that are really good about doing it, maybe 20%, that are really good about doing it on time. Jason: On their own without FilterEasy. Mark: Right, with the way it’s in, basically, I call it the open frame method because that’s what you’re doing, 10% or 15%, what we say is with our program, you’re going to take it up to 75% to 80% maybe 85%. That’s going to save you a lot on the problems, which has been reported. The data supports the saving. A lot of property managers, because of this program have been able to more easily hold them accountable especially with expiration dates. They can go on and view if they’ve got the right filter in or not, and some will actually increase their fines or other means. It’s just an easier conversation, there’s really no excuse not to change it now. That’s where, if you look at it from a big picture, that’s the value the program. Jason: I have an idea for you, psychological idea. Have you ever heard of the Pareto principle? Mark: I have, is that the 80/20? Jason: I believe the Pareto principle if I’m thinking of the right one is—maybe I’m thinking of the wrong one, but it’s the idea that time will take the amount that’s allotted. Some people will use up the amount of time that is needed or that is given to them—that’s the 80/20 rule, I’m thinking of the wrong principle. Mark: I looked up Pareto about a couple of weeks ago. Jason: It’s not Pareto, I can’t remember it but Mike Michalowicz who was on my show I think was talking about it on my profit first episode. It’s basically the idea or the concept that we will eat or use all the time that’s allotted to us. I would imagine, you’ve got an expiration date on it, if the note that went to them said, “This needs to be installed within three days’ time.” Or something like that just as a reminder that might increase that percentage slightly because then they have this deadline. Jason: They put that in there. Mark: The deadlines there, they will change it and that’s what’s cool about the program, of course since they signed that lease—I didn’t mention this, as part of it, we send in-hand reminder, but the tenants also get a notification email from us that the filter is coming their way. It’s a notification email. There’s tracking involved with all this, so everybody’s aware. Tenants get it, based off data we’re seeing definitely good, there’s been a definite increase. Like I said from our original way about going doing business, we’re always open to hearing from property managers, always open to hearing from people about how we can grow and get better. Our goal is to be the standard in property management, this is the way you change filters. If you’re a residential property manager, this is the way you do it. That’s our goal. If there’s anything we can do, as I go out and tell property managers, anything we could do, report to us, let us know, any ideas, we welcome them. Jason: This sounds like a no brainer, I am sure property managers are figuring out how to turn this into a profit center, a way to make money, it could potentially be an up-sell to the tenant, it potentially could be something that they pass on to the owner as part of a maintenance guarantee or program. That was called Parkinson’s Law. Mark: What’s cool is, not only do we get results from a functional standpoint, people are actually changing their filters, we have built it to be a profit center, too. That’s another thing that people like, an ancillary profit stream and what we tell property managers, we can help solve the issue, create a win-win for everybody from the operational front, we can also give you an extra $30 to $50 per door per year. That’s even a bigger win-win. With the climate of the industry, and I have heard a lot of regional property manager leads talk about this. A lot of big fish are getting in the business, a lot of people are becoming better, a lot of people are scaling their business. One of these programs that weren’t here 25 years ago are becoming necessary now for A, providing more operating capital to grow up, and B, competitive advantage. We’ve actually heard from property managers. Who are obviously getting tenants or retaining tenants providing services, but also tracking more owners with services like ours and others out there, too. There’s plenty of other vendors. From all sides and there’s definitely the profit side, we can help property managers implement this, we have all of the resources to help them implement this successfully, they can contact us one-on-one for that. The profit stream, the functionality for programs are like ours and others out there too. Jason: I think one of the hidden benefits of this that I think is brilliant is that, it’s being sent with a note and the property managers can customize how these notes look or what they say? Mark: We have a standard message and what it reads is, “Dear resident, your filters are inside. Please change them immediately and save 5%-15% off your heating and cooling bill.” That’s the generic, that’s your standard and it has a property management logo on it. If the property manager wanted to have something specific, we can set it up. Jason: That’s simple enough, what I love about this is that it’s keeping your property management business top of mind with these tenants. It’s creating a positive perception in their minds, they see that something’s actively being done in tangible reality, something corporal that they can touch, that is the evidence that you’re taking care of them. It’s like getting this gift in the mail that helps them live in their home and this comes periodically. It’s a reminder to tenants that they’re being cared for. I think little things like that go a long way to create perception about a company. Mark: What I tell property managers on top of everything else, they get to see your branding and they get that experience. They’re getting something from you, you’re helping them out, you’re making their life more convenient and your logo is right there, and you’re saving them money because the message is saying, “Look change it and it’s going to save you money.” They’re appreciative of it, “Hey, thank you for this, thank you for helping me save money.” From a tenant perception, they enjoy it. It just gives you a positive excuse to be noisy with your owners in a positive way, to remind them that you’re taking care of things. I had a job doing IT related stuff. I worked as a contractor at Hewlett-Packard, I worked at Verizon as well, in a call center for awhile, and one of the things I noticed and then before that, the company was doing actual IT on networks and stuff. One thing I noticed about being an IT is that, if you do your job amazingly well, nobody notices, nobody cares. If things don’t go well, everybody thinks you’re doing it wrong. I recognize that I needed to be noisy. I had a boss when I was at HP that was down in Texas. The guy just assumed that we did nothing all day long. All day long, I would send him little updates as to what I was doing through messenger, or change my status saying what I was working on, so that he would get off my back, and I realized he then started thinking—he was asking me about my teammates, “Are they working? How are they doing?” It just changed that perception I think that the fact that you can use something this simple as an excuse to let tenants and owners know that you’re taking care of their investment, it can go a long way towards the perception of your business. It’s all those little things that create a perception because one little bad thing, which is inevitable which will eventually happen with maybe every property, one little bad thing, that maybe their only perception of the company since they last started with you. I love that idea and the more things like that they can add, I’m sure the better. What should people know about FilterEasy? Any other top frequently asked questions that people ask you during the sales process that helps people make the decision? What else might they be curious about that are listening to this? Mark: One main thing I get is we already provide filters for tenants, this is a common one and I’ll just address this one. We provide your supply filters beforehand than the owner does, and they still don’t change them, so how would we expect them to change the filter? Now, it’s a lot easier for us to answer that because we’ve got data to show differences. However, just from a from a pure understanding and logistical standpoint, we actually agree that method they’re referring to work , doesn’t work, there’s a big difference between that and what we do. If you give them a year’s supply of filters upfront, if you give them a pack of 12 or whatever, they’re probably going to change it maybe that first time, but the rest are going to go in the closet or somewhere and they’re going to forget they’re there. Somebody is going out of their way, taking their time, wasting their time and somebody has wasted their money. That’s a big loss, that’s definitely not a method that’s recommended. The difference in what we do is A, nobody spends time going to get anything—but B, the in-hand reminder, the email we send out as well and providing that in-hand reminder to change them, which has really produced the results. The in-hand reminder is the big part because people forget. If you’re buying them a pack of 12, you’re supplying it for them, you might be eliminating that step of too lazy to go get them, but you’re not eliminating, “Well, I forgot,” and that’s the bigger one. That’s one of the common ones we get. It’s just understanding the market, I know property management is a very traditional business, but we have leaders emerging, that are showing the way and providing ancillary value, and providing awesome service to tenants and owners. Even if you’re just a service person, if you care about your people, you’re always looking for ways to make their experience better. It becomes a passion, it becomes a vision versus just a hobby. Finding programs like us or anybody like us are important. Opening your mind, growing your business, finding what outside the box ways to serve people. Stepping out of the tradition, stepping outside the box, and growing with the times, growing with the culture, and then providing awesome service to your people. Jason: You’re either going to compete on value or you’re going to compete on price and competing on price is a painful channel to go down. I love it, so increasing the value and then what you had mentioned before, just a note and the simple act of there being a note, including something in the lease, there are psychological motivators there and they are going to get people to take action over just sending them filters, and just having some sort of threat in the initial lease. They need a reminder. What I think is funny is, there’s a lot of property managers and I think these are only the inexperienced ones, but they give them a lease and assume that they’re going to read it, and assume that they understand everything in it, and assume that they’re going to live by it, but really any sort of contract or agreement only really tends to matter when there’s a legal issue. It matters afterwards when there’s a problem. It’s a device they only use as recourse or to come back at them legally, but by then, it’s too late. This really needs to be something that’s explained and I would imagine you guys tell them to do this, but I would say make sure when you put this into the lease, and you’re talking about making sure they change the filters, and that they’re going to be delivered to them, and this sort of thing that they just need to pop them in and put them in, that they go over this during the onboarding process with the tenant, because otherwise, the tenant might—you can’t just assume that they’re going to read everything in the lease or care. Mark: As far as implementation, I know if a lot of listeners out here are wondering, how exactly do you do this, get started and all that, you can contact us, it’s (864) 770-3909, again that’s (864) 770-3909. You can also shoot a message mark@filtereasy.com. Jason: Awesome, okay, great. Mark, I appreciate you coming out on the show. I think this is a solid value-add to what we’re putting out there for property managers, so I appreciate you coming and sharing FilterEasy with us, and I wish you guys success. Mark: Awesome, thank you for having us. I appreciate everybody’s time. about what’s good and what isn’t. There’s been positive feedback about FilterEasy in there for sure, so make sure you hop into doorgrowclub.com that’ll redirect to the Facebook group and you have to apply to join. We only let the business owners in, so the rest of you, don’t even worry about trying to apply, but if you are running a property management company, we want you in there and we have created an awesome community of collaboration over competition and that’s really what the industry needs right now. Mark, again, thanks for coming out on the show and the rest of you, we will see you inside the DoorGrow Club. Bye, everybody.